Underground Tank Removal Service Bradford West Gwillimbury | UST Removal Bradford West Gwillimbury | Specialized Onsite Services Inc. Underground storage tank removal in Bradford West Gwillimbury, Ontario may be required if you are a business owner, Realtor, Insurance Company or Home Owner. If you are selling a property you may need to prove that there are no underlying problems in order to satisfy a home inspector, or the potential new owners to obtain financing. Specialized Onsite Services Inc. can provide the means to test for a buried oil tank and removal of the fuel storage tank if discovered. Excavation of the tank will be done with care and efficiency. Once the tank is removed, soil samples are collected to identify any underlying contamination issues. 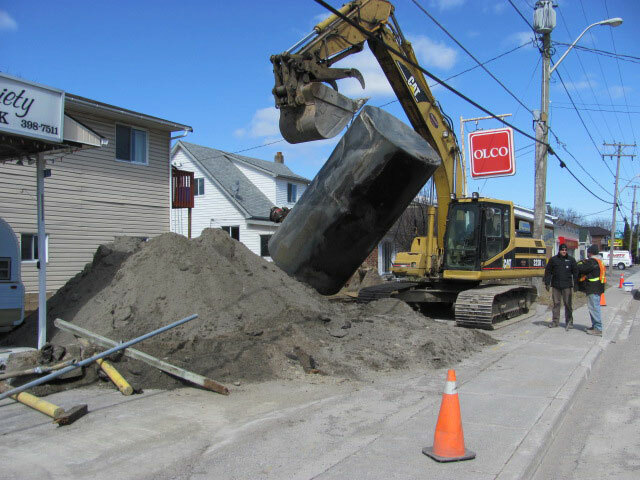 If it is determined that the soils surrounding a buried tank are contaminated, our team can also be utilized to your Bradford West Gwillimbury, Ontario location for the removal of the impacted material. The soil will be transported to a certified facility near Bradford West Gwillimbury, Ontario for contaminated soil. Once it is determined that all the impacted soil has been removed from the site, confirmatory or verification samples are collected for laboratory analysis. Assuming the site now meets the applicable MOE site condition standards the excavation site will be filled and your property restored. SOS is recognized by the Professional Engineers of Ontario as a qualified company in Bradford West Gwillimbury, Ontario meeting the requirements of the Ministry of the Environment and the TSSA to provide all the aspects of removing an underground fuel storage tank. If you have discovered an underground storage tank (UST) buried somewhere on your property in Bradford West Gwillimbury, Ontario? Not only is this a huge inconvenience, but it's also an environmental concern and must be handled by professionals. Call SOS team for help. Most of these old USTs are made of bare steel, which corrodes as time goes by, and leaks hazardous substances into the surrounding soil, water and environment. That's really bad. Often time, in Bradford West Gwillimbury home owners trying to sell their property, are required to get the underground storage tank removed before the sale can complete. Warning Bradford West Gwillimbury Residents & Businesses! Do not remove the UST yourself; this could result in damage to your property or even yourself. Call the SOS professionals today! Specialized Onsite Services provides underground storage tank (UST) removal in Bradford West Gwillimbury, Ontario. Our certified and trained technicians are able to remove and remediate underground storage tanks from any Bradford West Gwillimbury, Ontario location. We are recognized by the Professional Engineers of Ontario as a qualified company in Bradford West Gwillimbury, Ontario meeting the requirements of the Ministry of the Environment and the TSSA.